I have made an authentic pasta alla Norma only once. 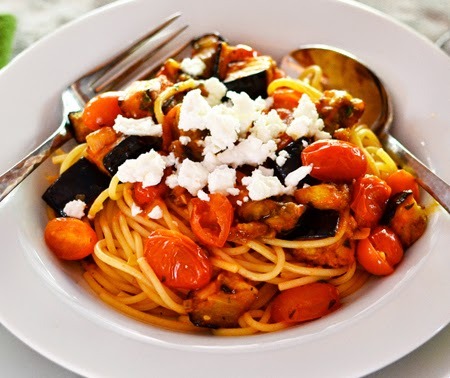 To be authentic, this recipe requires a few things: the right form of maccheroni (no, not little elbows), golden-fried pieces of eggplant, the best plum tomatoes available (San Marzano, of course), basil, and ricotta salata. I have made not-so-authentic pasta alla Norma a lot. I try not to fry things too often. First, the health benefits of the eggplant are pretty much negated by frying. Second, frying really stinks up the kitchen and, with our open kitchen, the whole house. By roasting, I use less oil, preserve the flavor and health benefits of the eggplant, and the house doesn’t smell like a fast food franchise. Roasting eggplant is not authentic. Neither is using feta cheese. 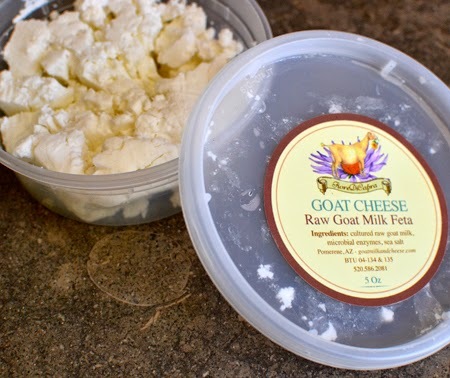 But I sometimes use feta cheese because ricotta salata is hard to get in Tucson. Truthfully, ricotta salata is the only cheese that really works for this. I have even tried Greek mizithra and, while better than Parmigiana-Reggiano, it still isn't right. The pasta shape. The type of maccheroni available here in the States won't do. Strozzaprete ("priest stranglers") work well, but are not always easily purchased. I use good, old-fashioned spaghetti. Not traditional either, though I see a lot of Google images with spaghetti. 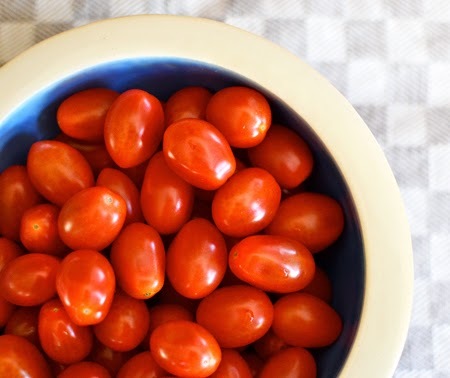 In the summer, we can get fresh San Marzano tomatoes from our farmers market. 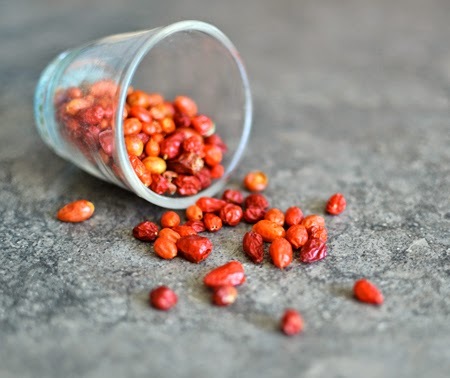 They are meaty and sweet, and make an unparalleled sauce. But they aren't yet in the market. For flavor, we find the grape tomatoes easily procured at most supermarkets make a really good sauce, so we use them. Canned San Marzano tomatoes work well, too. So rather than call my dish Pasta alla Norma and pretend it is authentic, I have decided that mine is a close cousin of Norma's, and a good cousin at that. Pasta alla Cugina di Norma. So, the original? I told you what is in it, but not where the name came from. This dish is a traditional Sicilian dish, said to be from Catania (Roque and Gabriella - does this ring true?). It was given the name Norma not for any particular diva, but for the character and opera of that name, Norma, by Vincenzo Bellini, a Catanese composer. Place a baking sheet in the oven and preheat to 400°F. 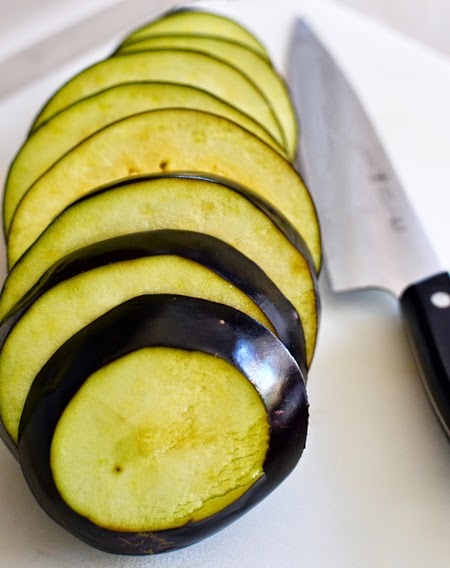 Remove stem end from eggplant and slice into 3/4-inch slices. Cut the slices into approximately 3/4-inch cubes, and place them in a large bowl. Drizzle with 3 tablespoons of the olive oil and season with salt and pepper, and toss to coat. Remove baking sheet from oven and line with parchment. 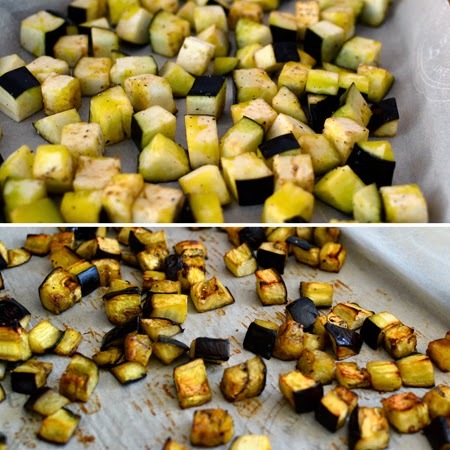 * Place eggplant cubes on the parchment in one layer and bake for 30 minutes, tossing occasionally. Meanwhile, bring a large pot of water to a boil. Place a large skillet over medium-high heat and add remaining 2 tablespoons olive oil. Add shallot and cook until clear. Add tomatoes and cook about 5 minutes, until they are softened and are releasing their juices. 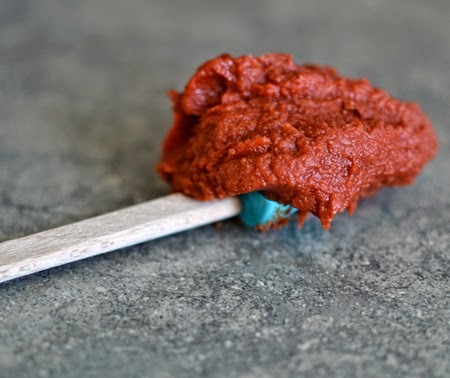 Add tomato paste and cook 30 seconds. Add white wine - a little at a time - and stir into the paste and tomato halves. Let cook until thickened. Add the chopped herbs, mix well, and remove from heat. About 10 minutes before eggplant is done, salt the boiling water well and add the dried pasta. 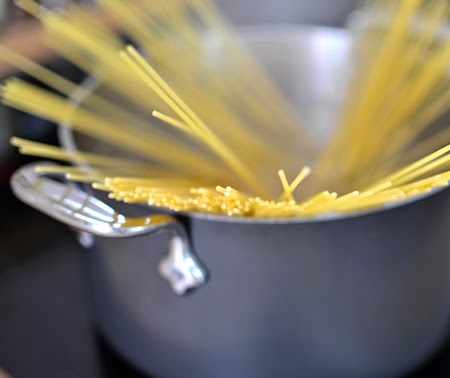 Cook until al dente (about 10 minutes) and strain, reserving 1 cup of the pasta water. Put pasta into the sauce along with roasted eggplant. Toss well adding pasta water a little at a time to make it the right consistency. Serve immediately in warmed bowls, topped with crumbled feta cheese. * Parchment is much better for roasting vegetables because, unlike on foil, the vegetables will not stick, and will brown nicely. Thanks, Ahu! Usually, I leave classic recipes alone, but I needed to reduce the calorie count of this one! Enjoy your weekend, too! Thanks Sarah - I actually went to Roma and the guy said they didn't carry it anymore. Maybe they were just temporarily out and he didn't know. I will check Sprouts, though, as it is easy to get to and on my way home. Priest stranglers? I need to look up the story behind that nickname. 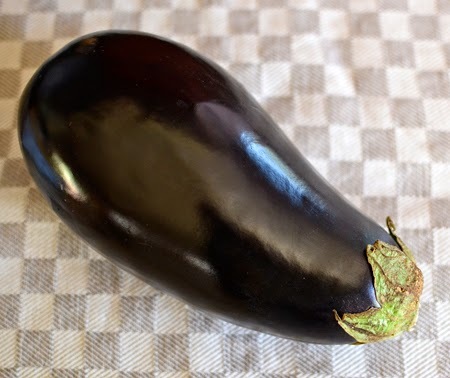 I'm quite partial to fried eggplant, any eggplant, for that matter. And I'm willing to forego the health benefits every no and then. Something tells me I'd like this pasta. John - I just checked Wikipedia (Markipedia is sitting elsewhere on the plane) and none of their stories behind the name are what I heard. It had something to do with make a pasta dense enough so that when the local priest visited, it would fill him up. And, yes, you will like this dish. Hope you can find ricotta salata! I LOVE that you describe the authentic version, yet come up with an alternate version with other ingredients and call it by a very close relative's name! 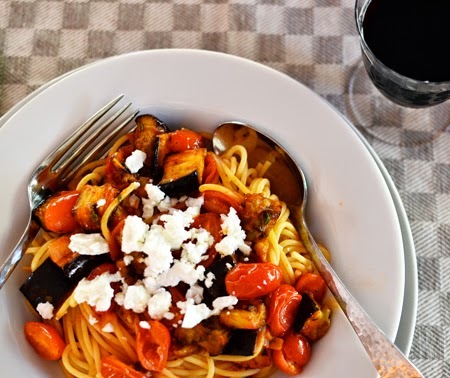 I wish other food bloggers and writers would do the same which would help uphold authentic Italian cuisine, without chipping away at the foundation! So many others would make your alternate version and still call it Pasta alla Norma! I too, have two recipes on the same post for Spaghetti alla Carbonara; one is authentic, and the other is my version which includes milk and cream, and often bacon instead of guanciale. I know that my version isn't authentic and make it abundantly clear so that others realize it too. I don't like the dry, eggy taste of authentic carbonara so I make it with a more creamy sauce. Chriatina - like you, I am a real proponent of authenticity. It makes me so angry when American chefs alter an Italian (or French, or Mexican, etc.) recipe and call it authentic. Just rename it like we did! HI David, the way you describe the traditional and Norma version makes me want to make a pot of each right away. It seems there is much fun in the kitchen and in the wording of this post. Very nice! Thanks, Cheri! Both rank very high in our list of favorite vegetarian recipes! You know, I have no problem being less than authentic, especially when I still use high-quality ingredients. There are no Italian food police coming to my house to arrest me!!! Your version looks fabulous!!! I agree, Mimi a using the best quality ingredients makes all the difference! I actually have strozzaprete (or what's left of the bag I hefted 3000 miles from the Italian market in Chelsea), and don't think I've ever used it for Norma, though I've made it several times (sans frying, baking with copious amounts of olive oil in hot oven instead). I truly think I bought it purely for the name! And I believe the true definition of a Diva is that whatever SHE wants to do, is what gets done, so I think you are totally fine and very true to the diva spirit! Chelsea in NYC? As I was reading David's post, I was wondering if I might find the strozzaprete in Chelsea Market! Good choice to schlep the pasta with you, Karin! We did the same thing. I bet you miss the Chelsea Market out there! And, yes, Susan - Chelsea, NY! Yum! Love this... and I do not see any dramas with amending classics! That's how new recipes are created. Thanks, Liz! It definitely is how things happen in our household! 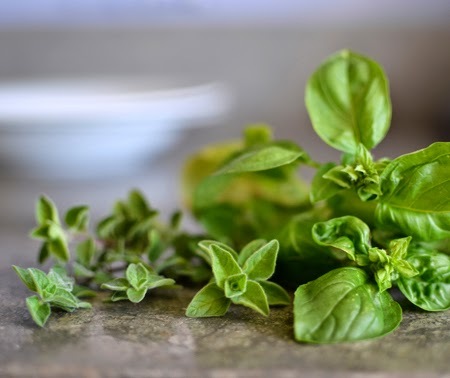 As you know, we have a lot of basil...I think it's a good time to make this dish! It looks delicious! Yes, Susan! And you would still have enough left for your vanilla gelato with olive oil and sea salt! Thanks, Karen - I think I need both! This one, I want to reach into my computer monitor and pick up that bowl. It looks delicious. I'm surprised you don't get ricotta there in Tucson. Do you guys have a TJoe's nearby? I'm not a big fan of ricotta - hate getting fat on things that have very li'l flavour. Feta is a great idea. Dear David, wonderful pictures and a fabulous and unique interpretation of an Italian classic - btw the wonderful ricotta salata is almost impossible to find here as well, unless you are willing to drive to an Italian market. And I do love ricotta - and enjoy making it at home - but be that as it may, your recipe looks fabulous! Thanks, Andrea! I really miss being on the East Coast where there were many Italian markets. I buy ricotta salara now anytime I see it! I'm a tuelly carnivore, but this pasta norma really damn delicious!!! lovin the boiling pasta photograph! Thanks, Dedy! We are truly omnivores - we will eat pretty much anything! The pasta photo was one of my favorites, too. I want you and Christina C. to make dinner for me! This looks amazing, David! That is a great idea, Valentina! Maybe we should make that happen next time I get to LA for work and have a free night! Thanks, Laura! It is the epitome of summer - love the fresh flavors, too! David - We made this recently when my sister and niece were visiting from the west coast. It was fabulous. So many good flavors. I had never roasted eggplant before - will be sure to use that technique in the future. We served it with gluten-free (corn) pasta. Thank you for sharing! Thanks, Nicole! Glad you all enjoyed it! The roasting technique on parchment works so well with many veggies, especially potatoes! Fiona - it is good to know that even diehards like your mother-in-law will deign to use another cheese if necessary. I have to say that I loved it when I fried the eggplant, but feel much less guilty when I bake it!